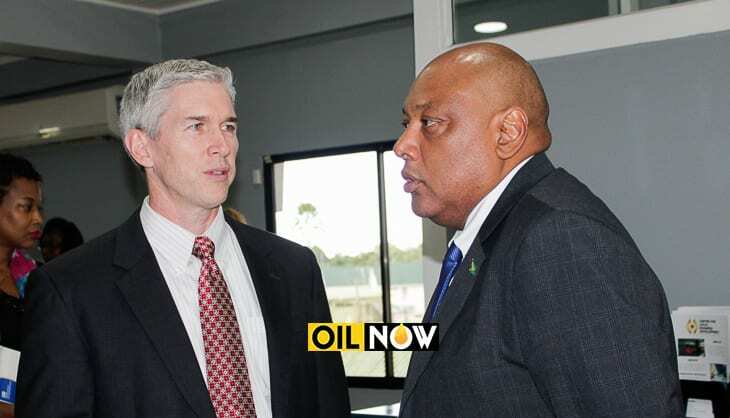 Exxon Country Manager, Rod Henson (L) and Guyana's Minister of Natural Resources, Raphael Trotman in conversation at a recent event. Guyana’s Ministry of Natural Resources said in a statement on Thursday evening that it joins the country’s President, David Granger, and the Guyanese people, in congratulating ExxonMobil and its joint-venture partners Hess and CNOOC Nexen for their latest discovery at the Turbot-1 well in the Stabroek Block offshore Guyana. The US super-major said today it began drilling the Turbot-1 well on Aug. 14, 2017 and encountered a reservoir of 75 feet (23 meters) of high-quality, oil-bearing sandstone in the primary objective. The well was safely drilled to 18,445 feet (5,622 meters) in 5,912 feet (1,802 meters) of water on Sept. 29, 2017. The Turbot-1 well is located in the southeastern portion of the Stabroek Block, approximately 30 miles (50 kilometers) to the southeast of the Liza phase one project. The announcement, following that of the Payara-2 discovery in July 2017, is another important milepost in Guyana’s journey towards becoming an oil producing country, the Ministry said. This latest discovery, the Ministry stated, also underscores the need for continued capacity building not only of Government and its agencies but also of the private sector, civil society and individuals to ensure that they contribute to and benefit from the oil and gas sector in an equitable manner.